In the world of expressive art forms, painting is one of the longest standing practices used to showcase the beauty of nature, humans, architecture and religious ideology. The concept of body modification, while not new by any means, has garnered a significant degree of popularity as the new millennium unfolded. No longer was the generation gap between those seeking to become a canvas for their artistic venture stuck in the single digits. The young, the old, men and women have all begun participating in this tribal rite, giving the culture of body modification a new medium through which to display its endearing, exotic allure. But what happens when old practice meets new? When painting and body art fuse together? One of the answers to this can be found at Jennie Philpott’s art exhibit titled Modified. With canvas renditions of various people and parts donning unconventional and controversial tattoos and piercings, some may be shocked at the lengths that some individuals would go to in order to reach a sense of satisfaction with their body image. One thing that Modified does particularly well, is go beyond the notion that beauty is skin deep. The 10-part exhibit covers piercings from facial to labial, and illustrates beautiful, vivid colours that evoke the emotion and power that these acts of modification mean to their owners. These bright depictions help captivate the eye and focus on the finer details that each brushstroke has provided to these canvases. What sets Modified apart is how boldly it approaches the subject, foregoing subtle touches to ease the viewer into the sight of these new depictions. What remains is a raw, unchained presentation that begs to be recognized, but also distanced from its modern peers. It challenges the notion of beauty through traditional agendas and discards the normative stereotype associated with external charm. When stepping into the gallery, you are greeted by three smaller paintings, two that are re-renditions of a larger, more prominently displayed painting at the end of the room. These harbour a different colour scheme and are portrayed with different textures and brush styles. When reaching the open, brightly lit center of the room, one is greeted with several, much larger canvases. These give context to the gradual evolution of the art form and help create a timeline to guide oneself by. 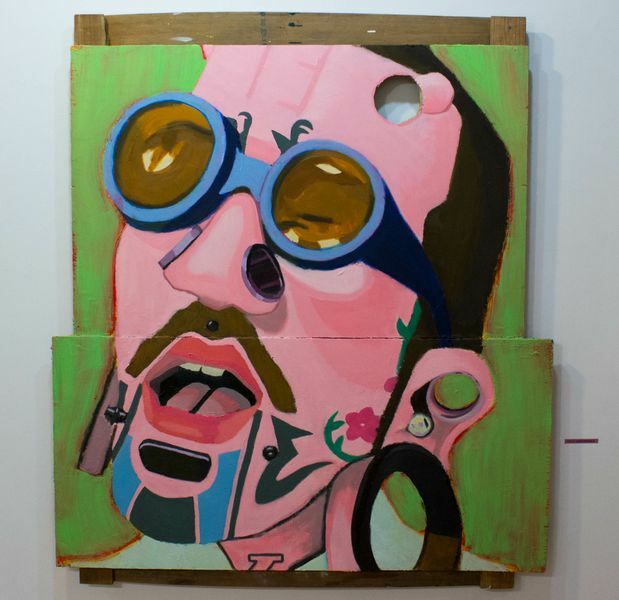 The large canvases at the center present a varied selection of colours and palettes and showcase a spectrum of styles, from the realistic, proportionate, painting of a man with several plugs, piercings and a pair of goggles, to a closeup of an earlobe adorned with an eyelet and several captive bead earrings. Philpott’s centerpiece, though, is the closeup of a model wearing a mask, and sporting bright green plugs in her earlobes. While one may think that this is the representation of the exotic, the piece represents a piercer, wearing her trademarked protective mask.The choice of cool colours and sharp edges help bring out the details of the piercer’s beautiful features, and ties the exhibit together in one thematic display. Regardless of your stance on body modification, or whether or not you harbour any of them yourself, Modified is an exhibit that sends a very strong message – it will reset your standards on the topic of beauty, and dispel prejudice you may have had about piercings and tattoos. You can check out the exhibit, Modified at the Rats 9 Gallery – 372 St. Catherine W. Suite #530 until Nov. 23. See our photo essay here.